Stormwater is rainfall or melted snow that runs off impervious surfaces, such as rooftops, streets, sidewalks, and parking lots. 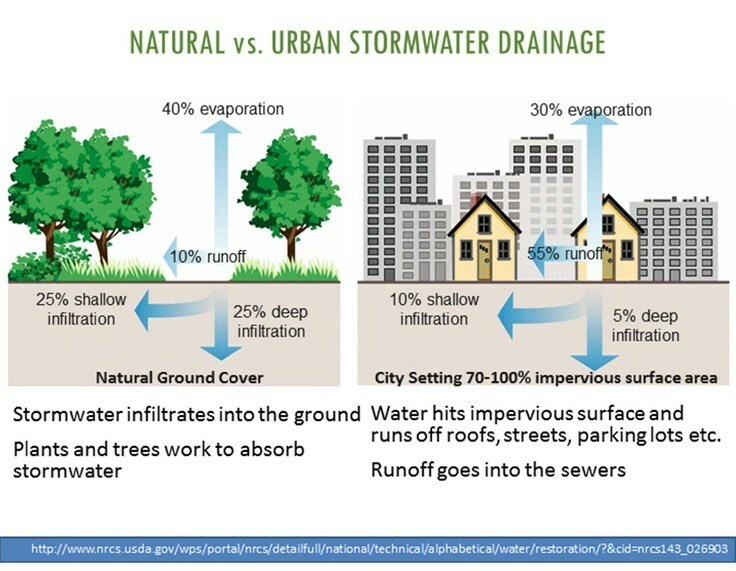 Impervious, or hard, surfaces prevent the storm water from naturally soaking into the ground, where the soil would filter out pollutants. As it flows, storm water picks up pollutants from these surfaces. Common pollutants include vehicle exhaust products, brake and tire dust, oil and grease, sediment, salt fertilizers and pesticides, pet waste, and litter. Because storm water is untreated, these pollutants enter our waterways. In 1987, Congress amended the Clean Water Act (CWA) to require implementation, in two phases, of a comprehensive national program for addressing storm water discharges. The first phase of the program, commonly referred to as “Phase 1” was promulgated on November 16, 1990. (55 FR 47990). Phase 1 in 40 CFR Parts 9, 122, 123, and 124 requires National Pollutant Discharge Elimination System (NPDES) permits for storm water discharge form a large number of priority sources including municipal separate storm sewer systems (MS4s) generally serving populations of 100,000 or more and several categories of industrial activity, including construction sites that disturb five or more acres of land. The second phase, the Stormwater Phase II Final Rule, is the next step in EPA’s effort to preserve, protect, and improve the Nation’s water resources from polluted stormwater runoff. The Phase II Final Rule was published in the Federal Register on December 8, 1999 (64 FR 68722). The Phase II program expands the Phase I program by requiring additional operators of MS4s in urbanized areas and operators of small construction sites, through the use of NPDES permits, to implement programs and practices to control polluted stormwater runoff. The Phase II Rule defines a small MS4 stormwater management program as a program comprising six elements, that, when implemented in concert, are expected to result in significant reductions of pollutants discharged into receiving bodies. The City of Brandon through the MS4 Program and City Ordinances is tasked with implementation and enforcment of the MS4 Permit Plan. This includes providing information, construction permitting and control, enforcement, screening, and education related to stormwater. Stormwater Ordinance – pertains to floods, retention, stormwater design etc. Environment Ordinance – pertains to land disturbance, illicit discharge, dumping, and pollution. You can help us with this effort by reporting illegal dumping, silt run-off and other storm water violations through our Citizen Request Page. You can also help us with this effort by taking a few minutes to make sure at your home or business “ONLY RAIN GOES DOWN THE DRAIN”. The following web site links contain information on storm water and general water quality. Go to the following links for information about this subject.